In 2017, Caldwell VanRiper (CVR), an Indy-based advertising, digital & public relations agency, randomly selected Horizon House in a contest for a professional video. CVR’s philosophy "Building Brands that Matter" inspired them to join #GivingTuesday by "Giving to Brands that Matter" and offering a local nonprofit the choice of receiving a gift of a video or a PR/social media training. 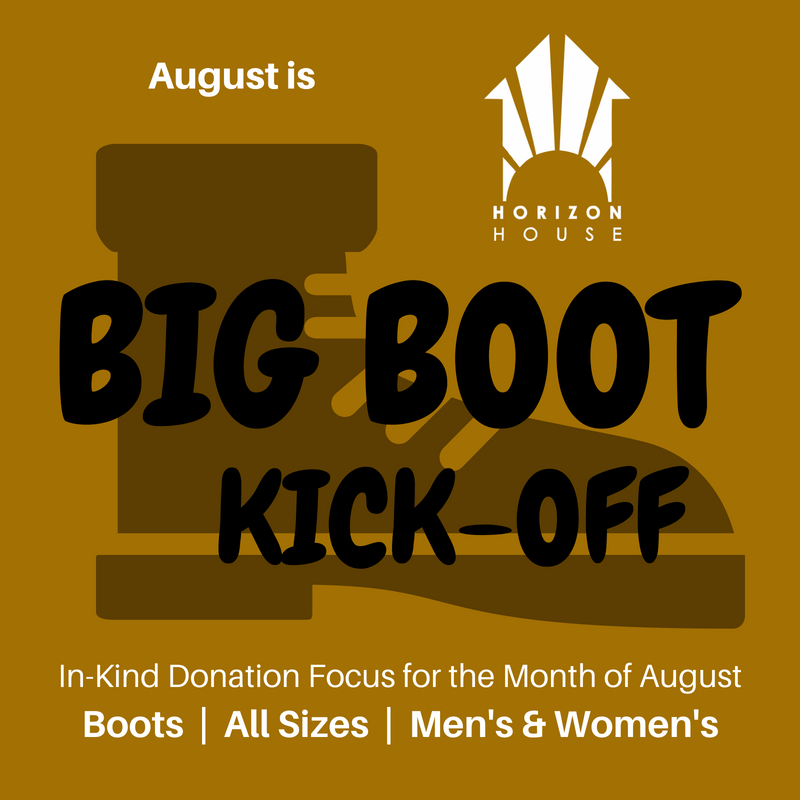 This video introduces Horizon House to the community, and provides a glimpse of the daily struggles and needs of our neighbors experiencing homelessness. 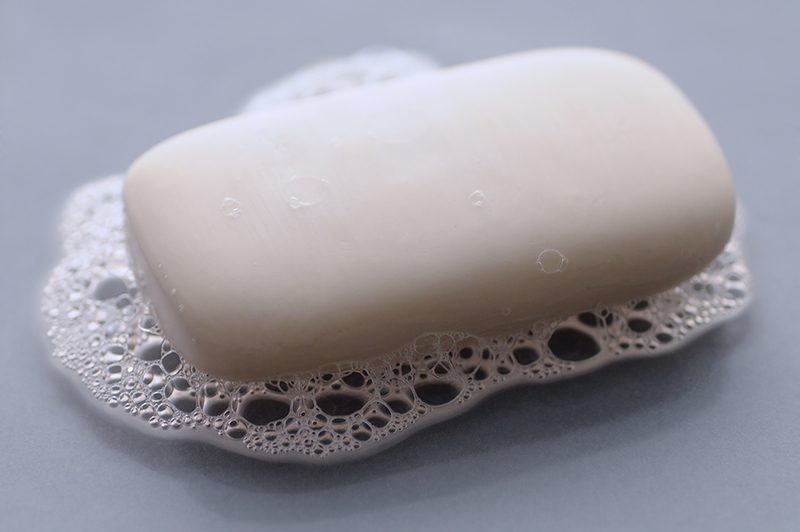 "CVR captured the reality of homelessness with an important marketing tool that we otherwise could not afford," said Teresa Wessel, Executive Director at Horizon House. 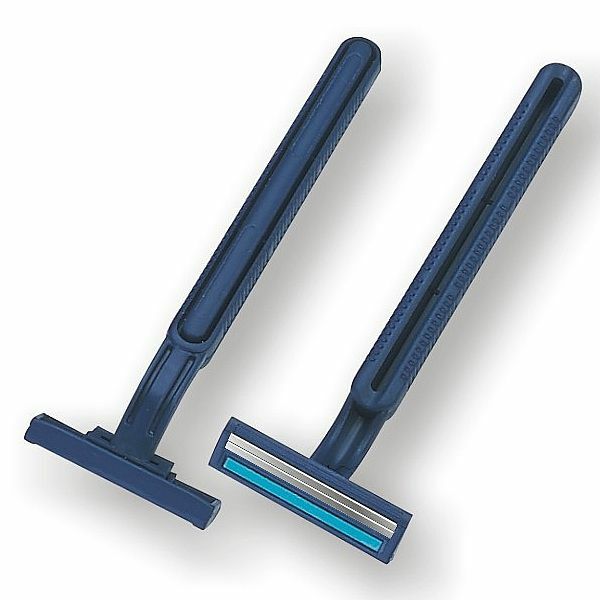 "We are very fortunate and grateful to have been selected." We thank CVR for all of their hard work, and proudly present the finished video. In the July episode of CICF’s podcast ‘For Good’, hear from Horizon House, Partners in Housing and the Coalition for Homelessness Intervention and Prevention (CHIP) about the realities of homelessness in Marion County and the collaborative efforts to end it. Listen to the podcast on CICF’s website. 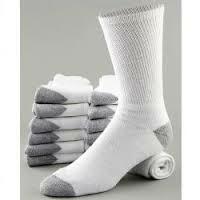 Our shelter is in need of socks, soap, deodorant, razors and men’s underwear sizes M&L. 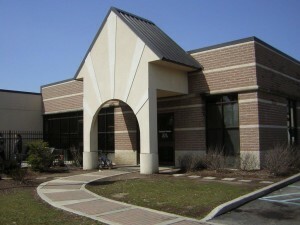 Donations of any wish list items can be made Monday through Friday from 7am-5pm at our Service Center at 1033 East Washington St, Indianapolis, Indiana 46202. 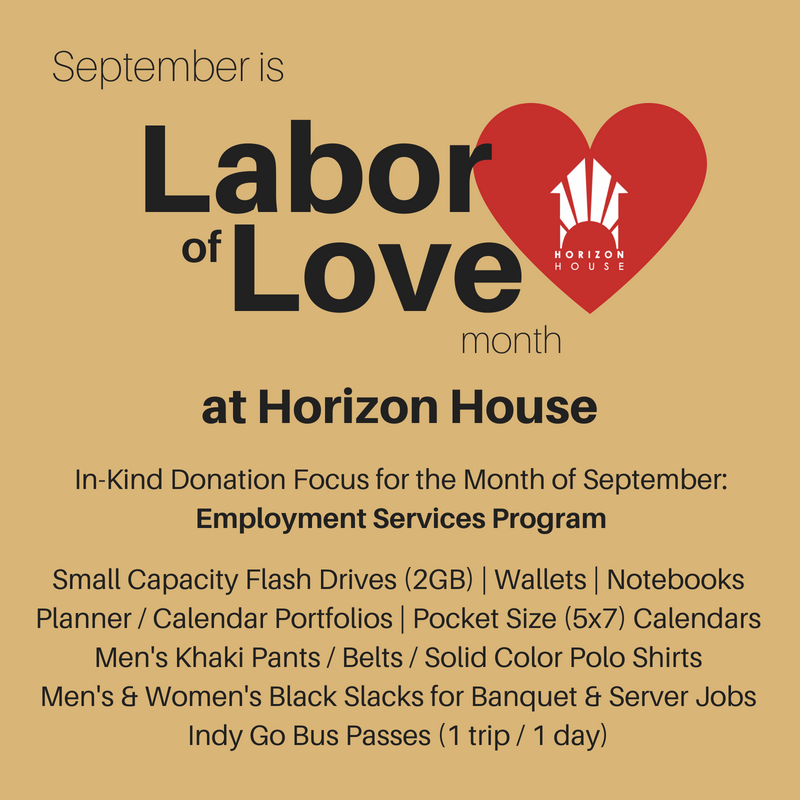 Please call (317) 396-6342 or email development@horizonhouse.cc for questions. 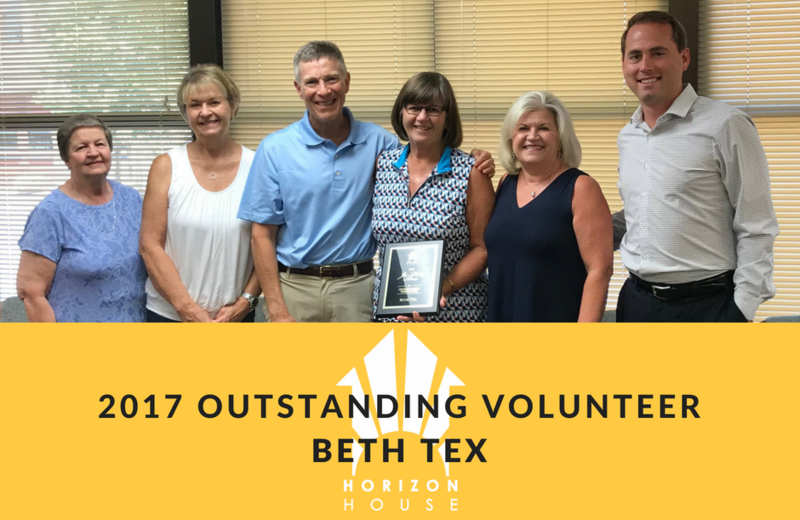 This month, Horizon House presented the 2017 Outstanding Volunteer Award to Beth Tex. Beth, a volunteer since 2010, provided over 150 hours of service in 2017 alone! Beth often serves as Horizon House’s personal shopper, using vouchers to go out and purchase clothing items, food and other necessities. "After being introduced to everything Horizon House does for our neighbors, I decided once I retired I wanted to help in whatever capacity I could," Beth said. "Once I started it seemed to blossom into wanting to help whenever I could, doing whatever I could." Some of Beth’s favorite volunteer activities include: shopping for clothes, food and household items; helping with Trivia night; and working at any outside events. Join us in thanking Beth Tex for her dedication to serving our neighbors! 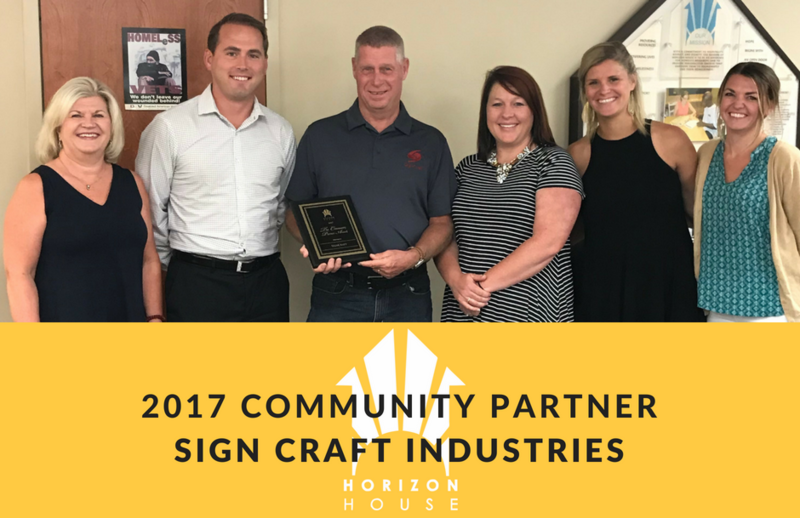 Horizon House also presented the 2017 Community Partner of the Year Award to Sign Craft Industries. In deciding to partner with Horizon House, owner Greg Beyerl said, “We firmly believe we have an obligation to give back to our community.” In the past three years, Sign Craft has supported 30 different charities. Along with financial support, Sign Craft provided t-shirts for our Walking for Dreams event, baseball hats for our Golf Outing, and created the beautiful mural that graces the rear wall of our Service Center. Thank you to Greg Beyerl and his team at Sign Craft for their support of Horizon House! CHIP: "Indianapolis Community Plan to End Homelessness Unveiled"
IBJ: "CHIP Unveils 5-year Strategy to Slash Homelessness in Indianapolis"
CBS4: "Group Unveils 5-year Plan to Address Homelessness in Indianapolis"
FOX59: "New Plan to Address Homelessness in Indianapolis Unveiled"
WISH-TV: "Indianapolis Leaders Unveil 5-year Plan to End Homelessness"
WFYI: "Indy Group Unveils Plan to End Homelessness in Five Years"